Building upon our highly successful Quest for the Snow Leopard in Ladakh, KarmaQuest in partnership with the Snow Leopard Conservancy is adding a second snow leopard trip to our portfolio. We have improved upon ast year's spectacular trip by adding one more night at high camp to increase the chances of a snow leopard sighting. This ten-day Jomolhari Base Camp/Bhonte La loop trek set against stunning Himalayan scenery coincides with the third annual Jomolhari Mountain and Snow Leopard Festival held in the best snow leopard habitat in Bhutan. If you are going to see a snow leopard in Bhutan, it is likely to be here. And if not in real life, you may see its image in a hidden trail camera. An added feature of the trip is two nights in a traditional family home. The village homestay program is in its initial stages and is part of an ecotourism program that aims to extend the benefits of tourism to mountain residents. Our feedback will help families better understand what visitors expect, and will reinforce the linkage between tourism income and protecting the snow leopard that draws us there. •	Cultural excursions before and after the trek including a 17th century monastery/dzong and excellent museums. •	Farewell dinner and presentation with Bhutan’s snow leopard experts. 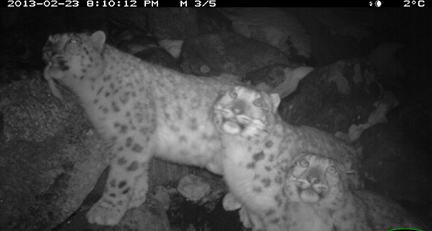 And in case we don't see an actual snow leopard, we’ll be checking hidden cameras that might have caught it or other wildlife on film. And we'll have plenty of opportunities to talk with Bhutanese yak herders and scientists who have seen the cats in the wild. You can also read a 2014 trip member's blog about the trip. Day 1: Arrive in Paro: Visit the National Museum for an introduction to Bhutan's impressive natural history, and time permitting (depending upon the flight arrival time) the Paro Rinpung Dzong with its spacious upper courtyard and prayer halls, and the Khichu Lhakhang, with one of the oldest temples in Bhutan built in the 7th century by the Tibetan Emperor Songsten Gampo. Then enjoy home cooked Bhutanese food and a trek briefing at a traditional farmhouse. Overnight, Paro. Day 2: A warm up hike to Taktshang Monastery (Tiger’s Nest: photo left), Bhutan’s most sacred site where Guru Rinpoche (who introduced Buddhism to the Himalaya in the 8th century) once landed on the back of a flying tiger. Tucked high into the cliffside its cave-like rooms are adorned with Buddhist art and alters, well attended by Bhutanese pilgrims. Overnight in Paro. Day 3: Begin the trek: Drive upvalley to the trailhead (9,480 ft) and start the trek with a gradual ascent, following the Paro Chhu (river) through a thick forest of oak, bamboo, rhododendron, and ferns. After lunch, the path continues to a meadow camp (10,000 ft). Hiking time: 4-6 hours. Day 5: Trek to the Mountain Festival: Trees become sparser as the landscape widens into patches of alpine meadow and starts to reveal views of snowy mounts Jichu Drake, Tsherimgang and Jomolhari (24,000 ft). We'll unpack for two nights of camping near Soe Yutoed village (elevation: approx 13,400 ft). Hiking time: 3-4 hours. 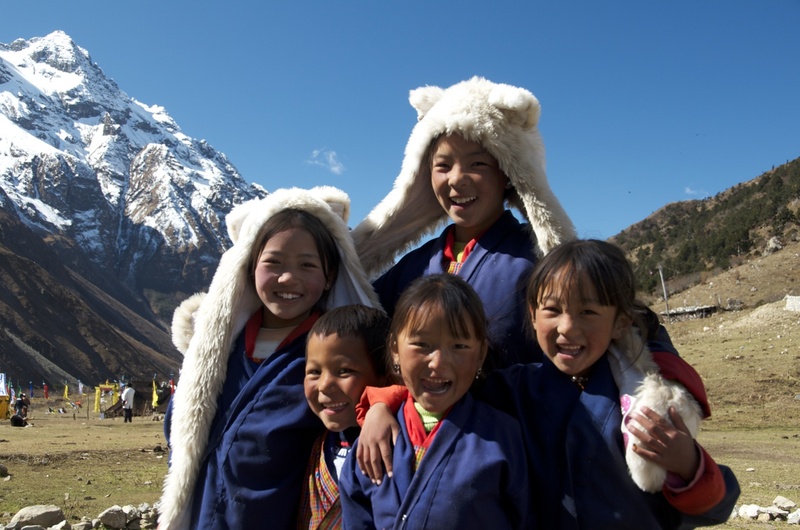 Day 6: Attend the Mountain Festival: Today we'll join local residents, school children, and other trekkers in this annual celebration of mountain cultures and the snow leopard. Our being there will help reinforce the message that the outside world also cares about the snow leopard. Day 9: Cross Bhonte La and overnight in a village homestay: From camp, we’ll climb to Bhonte La (pass), at 16,040 ft, the highest point on this trek route. we'll continue down the other side, watching for blue sheep and dazzled by the stark high altitude scenery. Overnight in a village family homestay. Hiking time: 4-5 hours. Day 10: Experience a day in the life and the home of a yak herder: We'll have a second night with our host family, learning and observing how subsistence farmers and herders live, and enjoying fresh cooked local dishes while hearing tales of their encounters with snow leopards.Overnight, homestay. Days 11-12: Enjoy the last two days of trekking -- almost all downhill! : We’ll leave this picturesque valley and follow the drainage of the Dhumzo Chhu to where it intersects with the Paro Chhu, which we'll follow downstream to the trailhead at Shana (9,480 ft).Drive to our hotel in Paro for a welcome hot bath and soft bed. Hiking time: 5-6 hours each day. Overnight, Paro (hotel). Days 13-14: Sightseeing in Thimphu: After a leisurely morning, drive one hour the capital city, Thimphu. 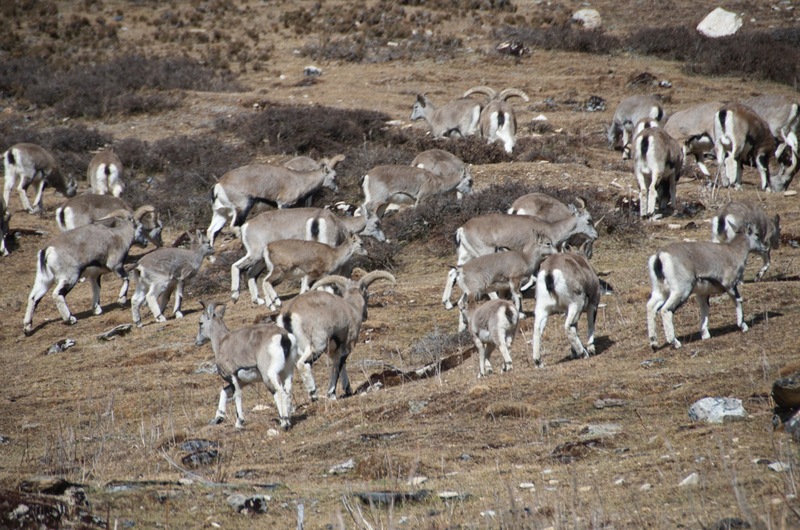 Visit the Takin Reserve, where these ungainly creatures -- Bhutan's national animal -- stand at close range inside an enclosure; a giant Buddha Statue on a hilltop, several excellent museums and the Memorial Chorten. On the last evening, enjoy a Farewell Dinner with Bhutan Foundation who will re-cap the snow leopard conservation program and eagerly hear your sighting tales. Overnight, Thimphu. Day 15: Depart Paro: Please inquire for assistance in booking your hotel or arranging for transport or sightseeing services in Bangkok or other stops en route to/from home (Note: not included in this trip price). Due to the limited space on flights in and out of Bhutan, we encourage you to sign up for the trip as soon as possible. Trip deposits are due March 30. Bookings will be accepted after that, space permitting. • Any other services not mentioned as included above. A tax-deductible donation of $500 (not included in the trip price) paid to the Snow Leopard Conservancy helps support snow leopard conservation, research, and ecotourism development programs.